Summer of 2015, I collected seeds from a parsley plant in my garden, enough for about 5 years of parsley. At the end of 2015's summer garden, I left one carrot in the ground in my garden's carrot patch, to go to seed this summer. Carrots are biennials, meaning it takes 2 seasons for flowers to develop. Over winter, the green top of this one carrot died back. In spring, it put on new growth. And I left it there, to flower. All summer long, this carrot's flowers have been developing seeds for me. 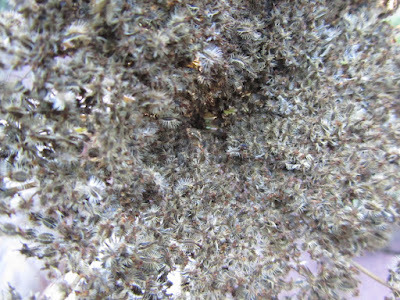 If you look at it up close, you can see there are hundreds of seeds on one seed head. And that one carrot produced 7 seed heads. 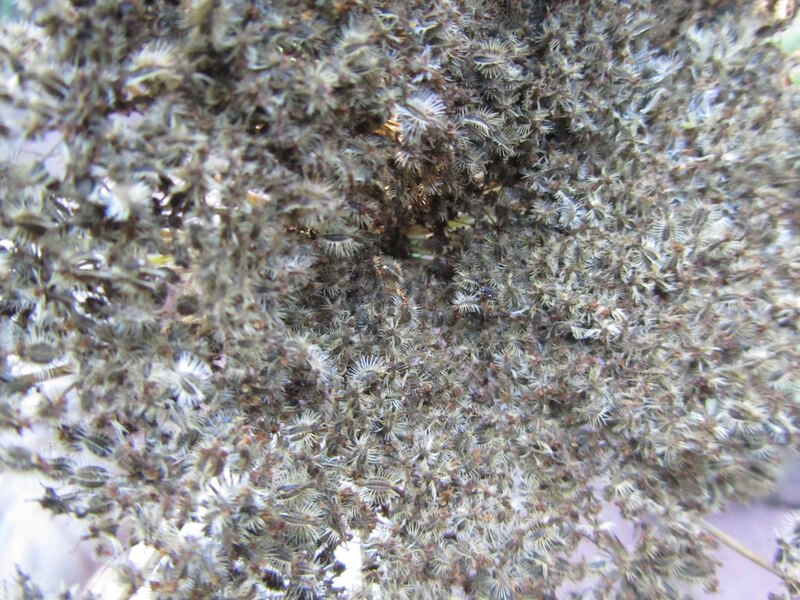 Carrot seeds remain vigorous in their germination for about 3 years. Some carrot seeds will still germinate beyond that 3 year mark, but the percentage of viable seeds will decline. 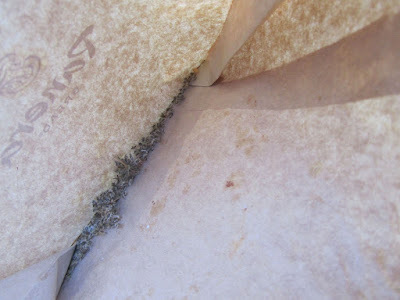 I shook the seed head over an open paper bag. 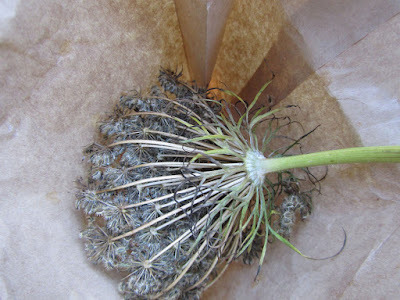 The remaining seeds will continue to dry, with the seed head, upside down and inside the paper bag, just sitting on my desk. 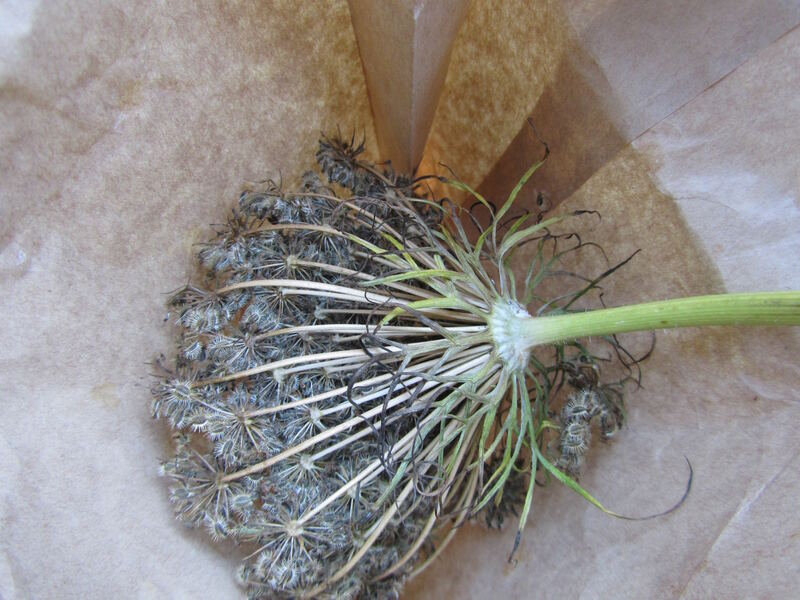 In a couple of weeks, I'll rub the remaining seeds off the seed head, and store this paper bag, inside my seed container, for planting next spring. I choose a different vegetable or two each year to collect seeds from. It's easy. It's thrifty. And it fits my idea of fun. Parsley is biennial, too. Mine comes back after winter, gives us some fresh parsley, then goes to seed mid-summer. 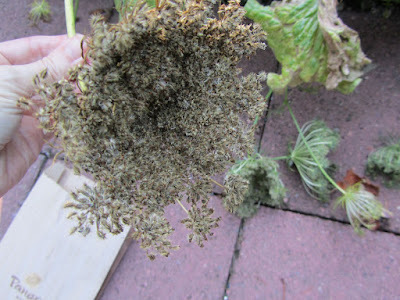 Does your parsley come back after winter, or does it die over winter? If yours can't live through a winter, there, you could dig up one plant, pot it, keep in a window and replant in spring. Carrots do produce a lot of seeds, don't they?! I know my one carrot has produced enough seeds for several years. Hope your day was wonderful,too, Lisa! Interesting! I did try this this year, but then realized it probably was a bad idea in my situation as I had planted 3 different kinds of carrots and collected seeds probably wouldn't breed true? I do collect chard seed as it grows like crazy here. Also, though I haven't technically saved any, I have taken some zinnia seeds off flowers and scattered them around hoping to have some grow. Same with our harlequin marigolds. You may have cross-bred your seeds, which could be interesting, too. Good luck with the zinnia seeds! I hope they give you a garden full of blooms! Well, they were yellow, orange, and purple varieties, so that might be interesting! The last patch I planted, I also added in Atomic Red carrots. Your a wealth of information. Some ideas I store away for possible future use. We always stored carrots that way during the winter months. From what I understand that's the traditional way to store carrots for the winter. We don't have a cool cellar/basement here. So I've always stored excess carrots in the garage fridge. I bet your carrots were super fresh and crisp, stored in sand. the variety of tomatoes growing out that side door. They reseeded year after year. I laughed out loud when I read your comment about your sister and the tomatoes! When my kids have homes of their own, I've always thought I'd give them rhubarb divisions, raspberry canes, strawberry plants and cranberry vines, to start their gardens. So maybe I'll add some seeds as well! I hope you had a great day, too, Patti!